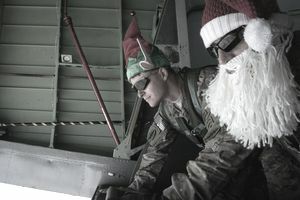 The holiday season is a great time of year to show the deployed members of the United States military that you care and thank them for their service. Most of us will spend the holidays at home, surrounded by the ones we love. Many service members willingly sacrifice time with their families so our country will have the freedom to enjoy these religious holidays. Every year, thousands of United States Military personnel deploy to foreign countries, remote sites, and ships/subs all over the world. The Red Cross Holiday Mail for Heroes program enables Americans to “Give Something That Means Something” during the holiday season. Beginning in 2014, there is no longer a national Holiday Mail for Heroes P.O. Box to which cards are sent. Instead, Red Cross chapters across the continental U.S. and Red Cross offices on military installations overseas will take complete control of the program. Check with your local Red Cross for times and locations of events and for opportunities to get involved. Homefront America sponsors two different programs during the holiday season: Homefront Santa and Gifts for our Little Unsung Heroes. Homefront Santa endeavors to match sponsors to military families. Gifts for our Little Unsung Heroes provides each registered child with unwrapped toys and/or gift cards. In addition, holiday meals for families are also provided. eMail Our Military is a charitable organization supporting our troops through morale boosting email, cards, letters and care packages. Troop supporters can take part in a number of support projects ranging from eMailing a service member one-on-one to general year-round support projects. Full Circle Home gives deployed servicemen a chance to send a gift box to their wives back home. Gift boxes contain pampering items, such as lotions, bubble baths, and spa socks. They also feature a handwritten note from the serviceman. Operation Christmas Spirit supports local military families by: “Adopting” over 100 families and fulfilling their Christmas wish lists with gifts for all family members and gift cards to do their own shopping; sponsor gifts and crafts at unit holiday parties; “Adopt” single Marines and Sailors, giving them gifts and gifts cards to celebrate whether near or far from their families. Operation Homefront offers many programs for military families throughout the year and Christmas. To receive a gift, you must register for your local Operation Homefront Toy Distribution. A military family may also participate in the organization’s holiday meal events and receive all of the groceries for a Christmas dinner. Thanks to the Marines Toys for Tots program, military and civilian children alike, have the opportunity to receive a new toy for Christmas. Donate or request a toy. Tree for Troops delivers a Christmas Tree that was grown on an American farm on the other side of the world, just in time for Christmas. Also, they offer spouses and children the gift of a free, real Christmas Tree while their family member is away serving our country. There are different ways to mail to a military member. See the APO, FPO, DPO link below for more details on how to address as well as dates to mail packages by to reach your soldier in time before Christmas. To assist people in sending gifts out on time, Military Postal Service Agency experts each year publish deadlines to get cards and packages in the mail. To ensure cards and packages arrive at their destination by Christmas, experts recommend the following guidelines. Packages going to military APO, FPO and DPO addresses sent by Parcel Post must be shipped by Nov. 12. Space-available mail, or SAM, must be sent by Nov. 26. Parcel airlift mail, or PAL, must be sent by Dec. 3. First class letters and cards and packages sent by priority mail should be mailed by Dec. 10, except for AE 093 which must be sent by Dec. 3 to ensure on-time delivery. Express mail must be sent by Dec. 17, except for APO/FPO/DPO AE 093 where it is unavailable. SAM packages are first transported domestically by surface and then overseas by air on a space-available basis. SAM parcels must be less than 15 pounds and 60 inches in length and girth combined. PAL service is space-available air transportation for parcels up to 30 pounds and 60 inches in length and girth combined. Some Muslim countries (such as Saudi Arabia) have laws against displaying Christian symbols. Please keep that in mind when sending cards and letters to the Persian Gulf (Southwest Asia). You'll not want to use envelopes with Christmas decorations on them as customs may refuse to allow them to enter the country. Additional Note: Walter Reed Hospital DOES NOT accept Christmas cards addressed to "A Recovering American Soldier" and the U.S. Postal Service will not accept mail addressed to "Any Soldier," "Any Wounded Soldier." Consider the reason why Americans back safe at home need to remember our military during this season. The Soldier's Christmas poem written by Lance Corporal James M. Schmidt in 1986 helps to offer a visual. This poem was printed in Leatherneck (The Magazines for the Marines) in December 1991.